For years I’ve been saving the leftover triangles from flying geese and snowball blocks. I usually mark a line for a second seam and before I even trim them off my project, I sew a little half square triangle block. I’ve been tossing them in a little box with no real plan for them. 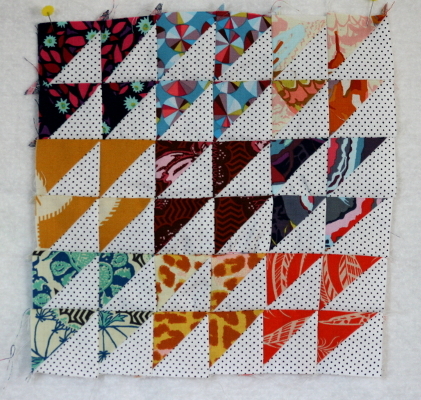 Recently I decided that it might be fun to sew them all together into blocks, and put the blocks together in an improv half square triangle quilt. 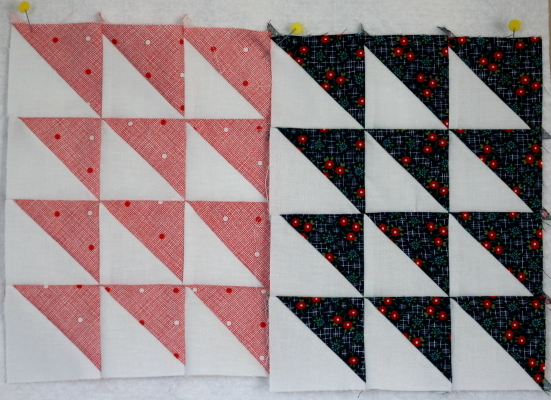 The sizes and colors of my HSTs are all different, so I don’t know how it will look in the end, but I’m excited to try it. 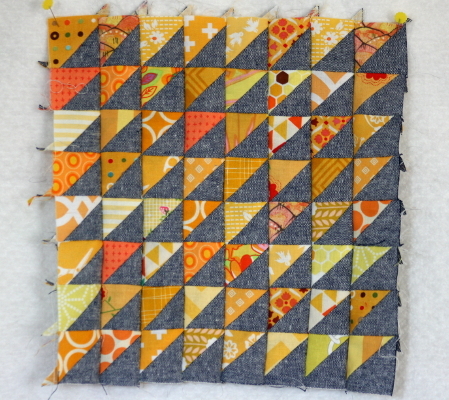 I also think it will be a fun scrapbook quilt, with bits of fabric I love from other projects. I haven’t done any trimming on these. Just sewing them together for fun. I don’t have a goal for finishing. I’m just going to play with the idea between other sewing projects and see what happens. One thing’s for sure – I have a lot of them! It will be fun to see what becomes of it. Okay recently my granddaughter sent me a photo from Pinterest (I believe from your hopeful homemaker website) of a dark red and white quilt. The pattern made a clever flower amidst cool triangle graphics. I would like to find out what quilt pattern this is (name?) and perhaps purchase the pattern from you?? Thank you. Hope to hear back from you! !